Cohen offered intriguing new information — but he clearly hasn’t made Mueller’s case. During his House testimony Wednesday, Michael Cohen offered new details about several matters of importance to special counsel Robert Mueller’s investigation — but said he knew of no direct evidence that the Trump campaign colluded with Russia. Cohen described Trump’s efforts to mislead the American public about Russia-related matters, and said that he has “suspicions” about whether collusion took place. He said Trump’s personal lawyer Jay Sekulow had reviewed and edited Cohen’s false testimony to Congress about Trump Tower Moscow. He claimed he heard Roger Stone tell Trump, on speakerphone, that WikiLeaks founder Julian Assange told him he’d soon release emails that would hurt Hillary Clinton’s campaign. He said that during the campaign, he saw Don Jr. furtively tell his father that he’d set up a meeting. He thinks this may have been the infamous meeting with a Russian lawyer, but he says he doesn’t know that for sure. But Cohen also batted down some past Trump-Russia reports and offered some information that could be helpful to the president. He said knows of no “direct evidence” that Trump or his campaign colluded with Russia (though, he said, he had “suspicions”). Accordingly, Cohen denied the Steele dossier’s claims that he went to Prague and met Russian officials to pay off hackers. We did learn new information, but it raised yet more questions than it answered about the president and his associates. Still, if you thought Cohen’s cooperation would make Robert Mueller’s case that Trump conspired with Russia, think again. Indeed, the mere fact that the Justice Department permitted Cohen to speak about all this may suggest that none of this information is crucial to Mueller’s investigation. To recap: Cohen admitted lying to Congress in 2017 about talks to build a Trump Tower in Moscow that he was involved in during the 2016 campaign. He had told Congress that the Trump Tower Moscow project ended early in the campaign, that he hadn’t discussed it much with others at the company including Trump, and that he hadn’t talked to the Russian government about it. In his plea deal, however, Cohen admitted that the talks continued at least to June 2016, that he briefed Trump and Trump’s family members on the project more often than he’d admitted, and that he talked with a Russian government official about the project. Many wondered why, exactly, Cohen lied to Congress — and whether Trump was involved. And in January, an explosive BuzzFeed News piece claimed that Trump had “personally instructed” Cohen to lie about the timing of the Trump Tower Moscow talks, and referred to “Trump’s directive for Cohen to lie to Congress.” However, Mueller’s office soon claimed that story was inaccurate. During the campaign, Trump would speak in coded language to him, telling him privately “there’s no Russian business” when he knew Cohen was working on the Trump Tower Moscow talks. Cohen did talk with Trump about his testimony, and Trump told him to cooperate with Congress, but also said, “There is no Russia, there is no collusion, there is no deal,” and that “it’s all a witch hunt” and “this stuff has to end.” Cohen said he interpreted that as Trump suggesting he should lie. In 2017, Trump’s personal lawyer Jay Sekulow “reviewed and edited” Cohen’s false statement to Congress about Trump Tower Moscow before he submitted it. 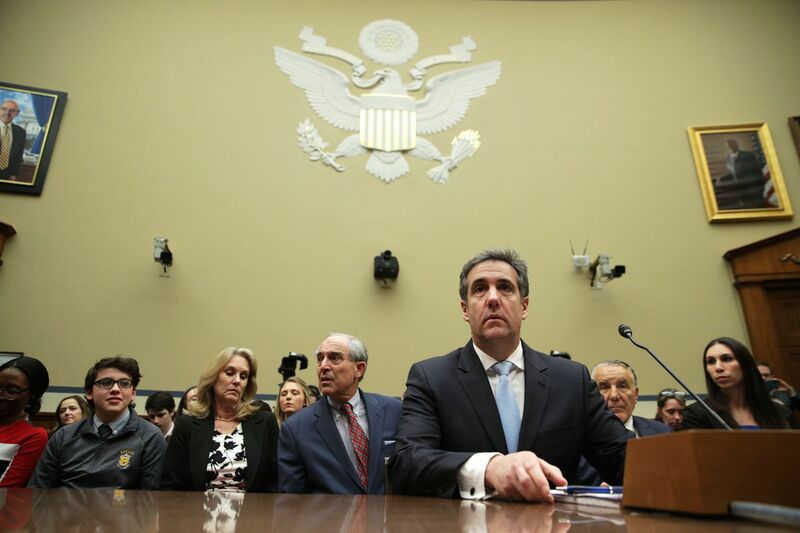 Cohen said “several changes” were made, “including how we were going to handle” the “message” about “the length of time” the project was still active. Sekulow issued a careful statement sort of denying this last bit, saying, “Today’s testimony by Michael Cohen that attorneys for the president edited or changed his statement to Congress to alter the duration of the Trump Tower Moscow negotiations is completely false.” But this doesn’t quite dispute what Cohen said — that they made changes to the “message” about the project’s duration. All this is not so clear-cut as the original BuzzFeed claim that Trump “personally instructed” Cohen to lie to Congress. Still, Cohen’s information, if corroborated, certainly suggests an effort by the president and his team to mislead the public and Congress. And it raises serious questions about whether Trump’s lawyer knew that Cohen planned to lie, and what exactly his involvement was. So all this will likely help inform the special counsel’s findings on whether President Trump or those around him obstructed justice. The most blatant Russian effort to interfere with the 2016 election was by hacking Democrats’ emails and then leaking them. Most prominently, WikiLeaks posted the DNC’s hacked emails beginning on July 22, 2016, and posted John Podesta’s hacked emails beginning on October 7, 2016. Trump’s team has said that they had no inside information about WikiLeaks’ plans and certainly no involvement in the hacking and leaking of Democrats’ emails. But Mueller’s team has dug deeply into whether that’s true, with a particular focus on longtime Trump adviser and political dirty trickster Roger Stone. The special counsel indicted Stone last month for lying to Congress about his efforts to get in touch with WikiLeaks, but the indictment didn’t provide a full explanation of what Stone knew or whether he succeeded. Around July 18 or 19, 2016, he was in Trump’s office when Roger Stone called. Trump put Stone on speaker. WikiLeaks started posting the DNC emails a few days later. But as to whether it’s collusion? The answer may be in the eye of the beholder. Cohen is not alleging that Trump did anything regarding the hacked emails. But this is yet another allegation that someone in Trump’s camp seemed to be aware, to some extent, of Assange’s plans. It certainly looked a whole lot like collusion. However, all participants involved have claimed the meeting was a dud. No useful information was offered, they’ve said. And Trump himself has claimed he knew nothing about it. This is an extremely vague claim. Cohen goes on to argue that he thinks it’s plausible that Trump would be told in advance. “Nothing went on in Trumpworld, especially the campaign, without Mr. Trump’s knowledge and approval,” he said. He also claimed that “Don Jr. would never set up any meeting of any significance” without “checking with his father.” But he doesn’t really know for sure. Indeed, Cohen’s testimony here made me think of a certain line in Mueller’s sentencing memo. “He has taken care not to overstate his knowledge or the role of others in the conduct under investigation,” the special counsel wrote of Cohen. Mueller has not yet mentioned the Trump Tower meeting in any of his charges. Considering his high-level role in the Trump Organization, his involvement in the Trump campaign, and his provision of information to Mueller, this is a significant statement. It makes it quite clear that Cohen’s “flip” did not prove a conspiracy. Furthermore, unless Cohen is blatantly lying in his new testimony, his account appears to put the nail in the coffin of some long-simmering claims from the Steele dossier (the reports compiled by former British spy Christopher Steele alleging a Trump-Russia conspiracy). The dossier claimed that Cohen had a major role in conspiring with Russia. Steele wrote that during the campaign, Cohen traveled to Prague at Trump’s request to secretly meet Russian officials. There, Steele claimed, they discussed how to cover up Trump’s relationship with Russia, and Cohen even discussed how to make “deniable cash payments” to hackers directed by the Kremlin. But very quickly, Cohen vociferously disputed this claim that he had been to Prague — and he continued to do so after his plea deal, and in his testimony Wednesday. The only news outlet that claims to have information indicating otherwise is McClatchy. A pair of reporters there filed a series of stories last year claiming there was some evidence that such a trip happened. But no other major media outlet has published anything similar. In any case, it’s difficult to imagine why Cohen would still be trying to keep this trip secret, if it happened, given his falling-out with Trump and efforts to provide information to the special counsel.